Recorded by "Clement" (150-211 AD), a Christian apologist. When John returned to Eusebias the churchman brought home then youth entrusted to his care, raised him and finally baptized him. After he relaxed his oversight, having put the seal of the Lord on him as the perfect safeguard. But some idle and dissolute youths corrupted him with lavish entertainment and took him with them when they went out at night to commit robbery or worse crimes. Soon he joined them and, like a stallion taking the bit in mouth, he dashed off the straight road and down the precipice. Renouncing God's salvation he went from petty offences to major crimes and formed the young renegades into a gang of bandits with himself as chief, surpassing them all in violence and bloody cruelty. “He is dead” groaned the old man in tears. The Apostle tore his clothing, beat his head, and groaned, “A fine guardian I left for our brothers soul! When John approached and the young leader recognized him , he turned and fled in shame. The young man stopped, stared at the ground,threw down his weapons and wept bitterly, flinging his arms around the old man, he begged forgiveness, baptized a second time with his own tears but keeping his right hand hidden. 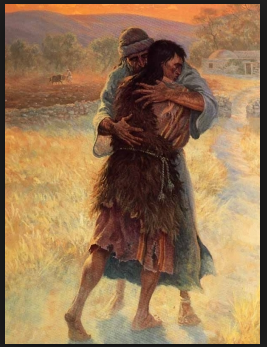 (his hand was unworthy of forgiveness for the bloodshed he caused) John however assured him that he had found forgiveness for him from the Savior. He prayed, knelt down, and kissed the right hand as being cleansed through repentance. Then he led him back and did not leave him until through prayer, fasting and instruction, he had restored him to the church : a great example of true repentance and regeneration, the monument of a visible resurrection.